Every knitter needs quality knitting needles to produce high quality fabrics. Interchangeable knitting needles are needles that are connected by a nylon cable, which is then screwed onto the needle’s base. Circular knitting needles will include a number of cables with varied lengths, which will give you more flexibility when knitting. There are various types of knitting needles on the market. From wood, to plastic, to straight to double-painted, these needles are made to improve the knitting industry. However, the interchangeable type of needles have made a breakthrough in the knitting industry (Source). With interchangeable knitting needles, all your needles come in one small case. That means that if you want to start your knitting projects at any time of the day, you have all the needle sizes you may require. This guide outlines the five best interchangeable knitting needles. It also lays down everything you need to consider before buying such needles. The needle has a sturdy case (usually black) with a smooth tip. The smooth tip is a little bit blunt but helps beginner-intermediate knitters by preventing them from splitting the yarns accidentally. That allows them to work accurately and faster. In addition to the blunt tips, the needle has a bamboo interchangeable and two styles of sharp place interchangeable. The entire three share a common connector style, and they give the knitter a variety if they need to expand their collection. 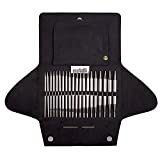 All the Addi knitting sets come with extremely sturdy cases with a lining of faux suede, pocket to keep the cables and elastic loops. The knitting needles are made from stainless steel of surgical grade with a pliable cable (usually red in color) and with a fine point. The finer point makes the needle preferable to knitters who work in small-gauge or detail projects more often, where precision is paramount. The needle is two sets in one package as it comes with three additional knitting needles compared to Addi (the first needle on our list). The Chiaogoo has two diameters of connections screwed in to accommodate the additional smaller needles. However, the need for the additional key to loosen and tighten the screw-in connections is inconveniencing. That is due to the reason that sometimes keys go missing at inconvenient times. That keeps your needle at hostage until you re-switch the key. Sometimes the additional that loosen and tighten key go missing, and that means until you replace it, you will no longer be knitting. Denise Interchangeable Brights are a cute and colorful set of needles made from specially formulated plastic resin. They are a reliable set of workhorse needles and come in bright colors. For that reason, they are suitable for children or beginner-knitters. Being suitable for children does not mean that expert knitters do not find the needles of good value. In fact, Denise Company was the first to make interchangeable needles. That said, most knitters have stuck with them ever since even after some more interchangeable knitting needles emerged. The cables for these needles are stiff however and are not recommendable for ‘Magic Loop’ knitting system. If you are starting out or even looking to sneaking needles into your carryon, the Denise Interchangeable Brights are a set you can lean on. HiyaHiya Interchangeable Needles Set is made of high quality stainless steel. The needle features a keyless screw-in connection with flexible cables. The size of the needles ranges from 2.75mm to 10.00mm, and a set contains 13 needles. The needles boast of smooth joins and a slick finish. They have sharp tips useful for decreasing or increasing intricate stitch patterns. Additionally, they also have four cables measuring (26”, 18”, 34” and 42”) which makes them easy to use. 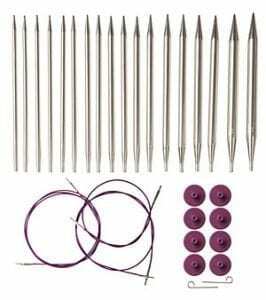 The needles come with many accessories, which are helpful to all knitters. By choosing this interchangeable knitting needle, you will not be disappointed. They are lightweight and easy to handle and can also warm quickly to the hands when knitting. Offer a full range of sizes. The Lantern Moon Rosewood is a covetable set of needles made from hardwood. They have gold-plated connectors with an attracting price tag. The needles have received plaudits for their ability to make the knitting experience enjoyable and treasurable. The set comes with 10 needles with a lovely red grain and a polished finish. They are topped with screw-in, gold-plated connectors, with a silk zippered case and 4 cables. You cannot pick these needles and feel disappointed. If you have not tried hardwood needles before, then by acquiring them, you are in for a texture that is somehow stickier than metal needles. That is an advantage, as most knitters prefer to keep stitches from accidentally sliding off the tips. Wooden needles can as well warm the hand. This can be useful for knitters with arthritis, hand pain or in cold climates. Like circular needles, interchangeable needles work by combining two needs but kick it up a notch in functionality and convenience. There are however a few imperative considerations you need to make to find the perfect interchangeable knitting needles. Knitting needles and crochet hooks come in a variety of shapes and sizes. Let’s take a look at them below. Straight needles are the most common type of knitting needles. These come in a pair and can measure 7 inches all the way to 14 inches. These needles are best used for light jobs such as scarf or baby blankets sewing. Arguably, the most versatile knitting needles, circular needles are usable on any project sizes. The needles usually come in pars held together by a cord. These come in lengths of 16”, 20”, 24”, and 32”. Circular needs are mostly used for large projects such as knitting blankets or seamless sweaters. One major advantage of this needle is its even weight distribution. This means it can rest on your lap while you knit making them light on your wrists. Because they can also be used for small projects, circular needles are an excellent all-round choice. Commonly known as DPN, these are pointed at both ends. Normally sold in batches of four or five these needles are for use when knitting without a seam. DPN’s best use comes when stitching baby hats, socks, or seamless sleeves. 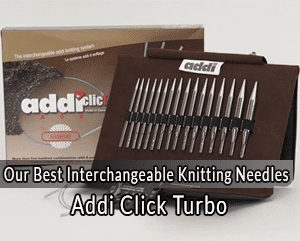 Interchangeable needles are an excellent choice for a dedicated knitter. The set is normally comprised of short needle tips that are somewhat similar to circular needles but with different sizes. Interchangeable needles snap together, but some models require you to screw the pieces together. Though buying the set might seem expensive, you are better off than buying different needle lengths separately. Most come with a casing that makes it easy when storing and organizing yourself before a knitting session. The most familiar needle material metal makes knitting both smooth and fast. Metal is ideal for hairy yarns as it prevents snagging of the stitches as they slide. Metal needles have pointy tips that help when working with yarn weights and complex stitch works such as cable knitting. Many knitters are fond of the classic ‘clicking’ sound that emanates while in use. Other people dislike this sound and find themselves opting for quieter options such as wood. Wooden needles are slowly overtaking metallic ones as the standard tool with bamboo firmly holding its place as the most popular needle type. Wooden needles are mostly made from hardwood trees and offer a quick knitting speed, soft touch, and warmth that lacks when using metallic needles. These benefits are what make wooden needles the most expensive type. Bamboo needles offer a cheaper alternative to traditional wooden needles with an equal amount of warmth and softness. These are especially good for knitters who are suffering from arthritis or carpal tunnel. Like wooden needles, plastic needles are soft to the touch, comfortable and warm. These are light in weight and are also the most affordable needles you can find. These come in a wide variety of sizes, therefore, making them best for knitting jobs that require large stitches. Plastic is the best alternative when stitching other materials such as rope, plastic bags, and rags. They also come in a variety of rainbow colors making them a great choice for kids who are learning to knit. When choosing a needle size, it is important to consider the tightness of your knit. One foolproof technique of finding a proper fitting needle is by using a gauge. A gauge is the number of stitches per inch that a knitter does with a particular yarn and needle. Generally, straight knitting needle lengths vary from 18 to 40 cm. Double pointed needles usually come in three lengths, 15, 20 and 23 cm. Circular needles on the other hand also vary from 20 to 150 cm. Cables for use with interchangeable needles work in the same manner as circular needles. They provide a holding area while you stitch. The cables are usually made from plastic or steel coated in plastic. The cable ends connect with the needle tip, connectors, and end caps. Some interchangeable needles have a swivel cord that enables 360-degree rotation while knitting so that the swivel cords can stay kink-free while knitting. If 60 inches is not enough, connecting cables can offer good spacing for your stitches. Most sets have this included so that you can easily knit blankets in one piece. When knitting, the chunky yarn connector will do a great job in holding the heavy yarn. End caps take point protectors to a completely new dimension and add more versatility to interchangeable needles. The benefit of an end cap is that it can change a circular needle into s straight needle by simply connecting it at the end of each cable and placing a cap at the opposite end. When trying a garment’s fit, you can also hold stitches onto the cable when stitching needles. Cables and needles easily connect together, but some manufacturers go the extra mile to include a small wire pin to help tighten the connection. The pin does not aid in tightening the screw but most importantly gives you leverage as you fasten the needle to the cable. For knitters who are fond of losing parts easily, you will be better off with interchangeables that click together. 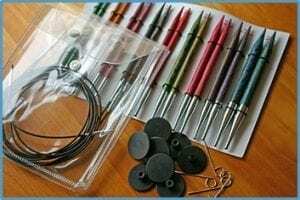 Interchangeable knitting needles come in various sizes and different material constructions and making the right choice is difficult for many. Because finding the product that meets your needs can be hectic, you are better off going through this review above or asking an experienced knitter. Even so, his or her words are not final because you have personal preferences. You have to consider the needle material, and accessories such as connectors, end caps, grippers and other small but important parts. Finding a good interchangeable knitting needle will definitely increase your affinity to knit and the sooner you do so the better. Please let us know which interchangeable needle suited you best and why.